This is so bad. 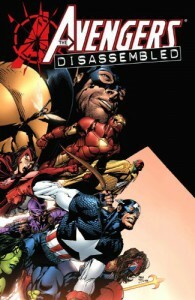 Not as bad as Avengers Disassembled: Iron Man, perhaps, but really really bad nonetheless. A bunch of different people and/or things attack the Avengers, one after another. Everyone who has ever been an Avenger shows up and bands together, while the rest of the world is suddenly disenchanted with the Avengers because Tony, acting under a mysterious compulsion, called out the Latverian ambassador for being Latverian whilst he was addressing the UN. All of this turns out to be because the Scarlet Witch is pitching an epic chaos magical hissyfit. It turns out that if a woman is so distraught by her infertility that she magics a pair of children into existence, it is not an adequate therapeutic protocol to magic them back out of existence, wipe her memory, and then hope that none of this ever comes up again. I know, right? Magical DSM should have been more specific. There is a flashback/reprint of when Wanda and Pietro joined the Avengers: colorful, carefree days when no one realized that in the future, they could be written by Michael Bendis. Then all the Avengers reminisce for pages about their best Avenging memories. Ultimately, though, Tony says he has to shut the whole show down, because he's completely broke. Whoops.